Even formal critical reexaminations of the prequels have popped up online, like the “Star Wars Ring Theory,” which attempts to argue that the prequels, rather than following traditional dramatic structures, are arranged in a complex ring pattern that matches up to specific story elements and images of the originals. Star Wars fandom has developed an odd bifurcation, built on the notion that preferring the original trilogy—that swashbuckling, lightsaber-swinging, state-of-the-art effects-laden epic—is an inherently superior form of fandom than preferring the prequels, that other swashbuckling, lightsaber swinging, state-of-the-art effects-laden epic. 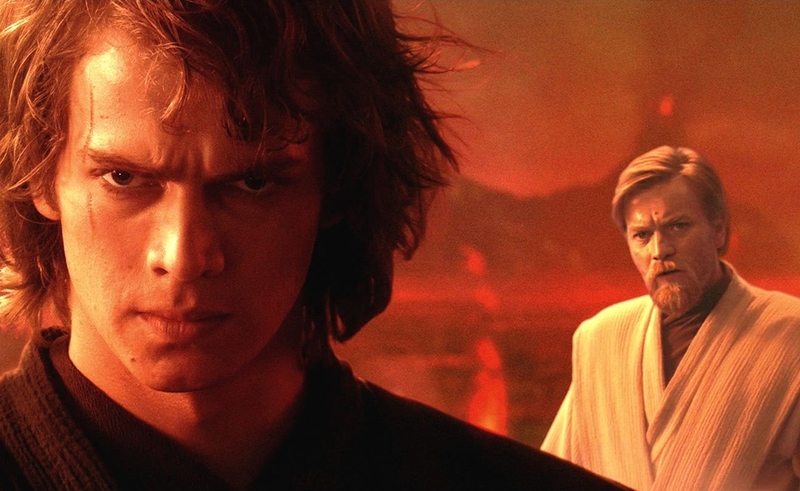 Fondness for outdated effects aside, it can’t be ignored that those who saw Revenge Of The Sith in their formative years may have genuinely responded to the story of Anakin Skywalker. Regardless of Sith’s terrible execution, there are legitimately potent images in the final installment: a roomful of children flinching as Anakin draws his weapon, Anakin Force-choking his visibly pregnant wife, Anakin’s final moment of defeat, maimed and burning alive. While weak storytelling deflates much of the dramatic tension of these moments, they still have the potential to be haunting, especially to young viewers. After all, the most memorable entertainments of our childhoods are the ones that induce a little trauma. Nostalgia works on the same register as trauma, imperceptibly planted at a formative time, and inextricable from our emotional engagement with experiences that bring us back around to those memories. There’s nothing wrong with allowing nostalgia to guide our tastes, but measuring things from our own childhood against other people’s childhoods becomes a sticky proposition. What does this fandom fissure tell us as we enter the final months in the lead-up to the release of The Force Awakens in December? Abrams and his pro-analog-effects tack is certainly understandable, but it runs the risk of alienating prequels fans. There are two sets of Star Wars boosters for J.J. Abrams to live up to, with two sets of ideas about what “their” Star Wars is supposed to look like. But what’s most exciting about the new trailers are the ways The Force Awakens looks nothing like any Star Wars film we’ve seen before. The basic iconography is there: lightsabers, stormtroopers, Rogue Squadron pilots, the Millennium Falcon. But the visual language is pure kinetic Abrams. This is to be expected. Films are a product of the technological and aesthetic limitations of their time. The fact that the digital worlds of Revenge Of The Sith and the previous two prequels looked nothing like the original trilogy isn’t inherently bad thing. It’s simply the reality of making films in a franchise with entries separated by decades. The reasonable expectation is that the new trilogy (and the ancillary films) will look nothing like the beloved originals, nor the derided prequels. With any luck, they’ll usher in an entirely new Star Wars visual language that will be loved by yet another new generation of fans. Through ups and downs, Star Wars has more or less weathered the years, adhering to underlying themes and ideas that have remained universal and stalwart. It’s a malleable, ever-evolving entity that has grown alongside its fans. By constantly changing to fit the times—and by constantly finding new fans, which may not revere the exact same things as the old ones—it promises never to become a relic of the past, like hokey religions and ancient weapons.